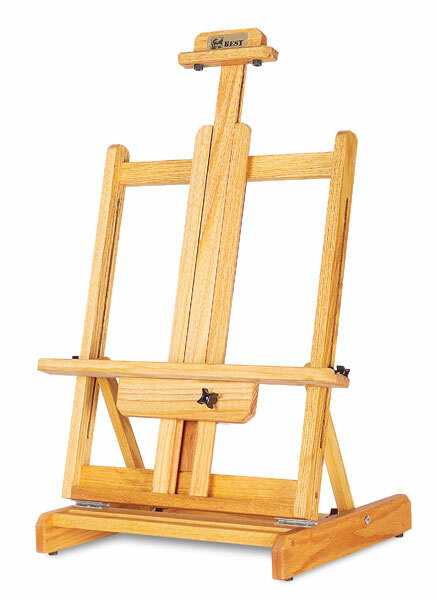 Like it's floor-standing counterparts, the Best Deluxe Tabletop Easel is a piece of fine furniture as well as an easel, hand crafted and hand finished from select red oak, and using only the finest hardware. This sturdy and durable easel can be used on any flat surface. Its expandable mast adjusts to accommodate canvases up to 36" (92 cm) high. Easy angle adjustments can be made using slide guides. The tilt adjusts from 0° to 85°. The Deluxe Tabletop Easel ships fully assembled from the factory, via UPS. It folds easily for storage. It makes a great addition to the Terrero Taboret.